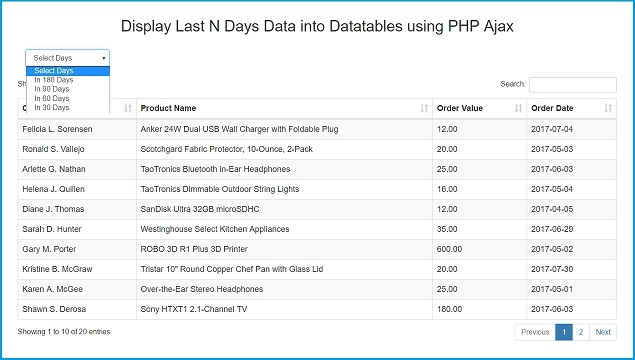 In this blog we have made discussion on topic like How to load last dynamic days data into Datatables by using PHP script with Ajax Jquery. Most of the programmers are used Jquery Datatables plugin for display data in tabular format on web page. Because it is light weight and it provide lots of feature like search data, sort table column, pagination and many more other features. So for example now we want to load last 30 days data from mysql table by using PHP script and display under Jquery Datatables plugin. Because this type of feature is not found under this plugin. For use functionality of this feature we want to write some extra code at front end and back end. Here we have use HTML select box for list number of days. So user can select days for get last particular days data. When user select days from select box then we will first destroy Datatable by using destroy() method and then after we have again called Datatables Ajax request with value of days select from drop down list box. So here we have send value of selected days to server via Ajax request. On PHP server script we have append query with condition like fetch data between both date. In condition first we want to get start date, so for get start date we have minus selected days from current date. So this ways we have get start date and for end date we can get from CURDATE() mysql function. So this ways we can get start date and end date for fetch data between this two date. So this ways we have append query for fetch last particular data from Mysql table and it will load data without refresh of web page. If we have use date datatype in table then this feature will helpful to fetch last N days data from table by using PHP code with Ajax JQuery. By using this functionality with Jquery Datatables plugin then we can easily get last particular days data and load into table. This feature will increase the value of your code and add extra functionality into Datatables features. So I hope you have understand this topic which we have describe in this post. Below this you can find source code of this post. Amazing lesson as any lesson made by You! Thank You endlessly for the great job, ideas, creative projects in general!